Anyway. It only feels appropriate so share a Lemonade cocktail recipe today, so without further adieu: The Lemonade (and Cuervo) cocktail. All you need to make a pitcher this simple sipper is the juice of 8 lemons, 1/2 cup of simple syrup and 4oz of tequila. Stir together with ice and refrigerate. To serve, add a sprig of mint (if you're feeling fancy) and get in formation. Yes, it's true. I did recently purchase a copy of Gwyneth Paltrow's new cookbook, It's All Easy. Yes, it's a signed copy. Which means, yes, she touched it with her actual hands. And that means I'm one step closer to my queen, Beyoncé. What, you didn't know they were BFFs? There's a dedication to Blue Ivy herself inside the book. Believe it. But seriously. There are some pretty solid ideas in there for busy people (who isn't?) who want good food and that's easy to make. One such recipe is her variations on the breakfast/lunch/snack/whenever staple of Avocado Toast. Of which, GP is the self-proclaimed queen. Today I made her Asian-inspired version - topped with veganaise (of course) sriracha, avocado, a soft boiled egg, and - my personal favorite part - furikake. To anyone unfamiliar, it's an asian rice seasoning comprised of sesame seeds, dried seaweed and spices. It's delicious. Get thee to an Asian grocer and pick up a bottle. You'll thank me later. Happy weekend - and happy Coachella! To those of you who are attending. To those of us who aren't (ahem, me) let's all take a moment to appreciate that this is the kickoff to Music Festival Season. Of course, you don't need to be in Palm Springs to enjoy all the style that festival season has to offer, so if you're in need of some inspo (for Coachella or otherwise) look no further. If I've said it once I've said it a thousand times - layering is your best friend. Music Festivals often means day-to-night dressing, and the key to nailing that is having pieces you can add and subtract as the temperatures change. For example, I'm really having a moment with this whole neckerchief thing. It's cute and very throwback Fred-from-Scooby-Doo vibes. I'm here for it. I also threw on a pair of cheap mirrored shades, because why not. Lastly, throw on a pair of chucks (or equally comfortable footwear) since you're bound to be standing - and dancing, hopefully - for hours. If you do take a seat, make sure you're wearing something that you can get a lil dirty. 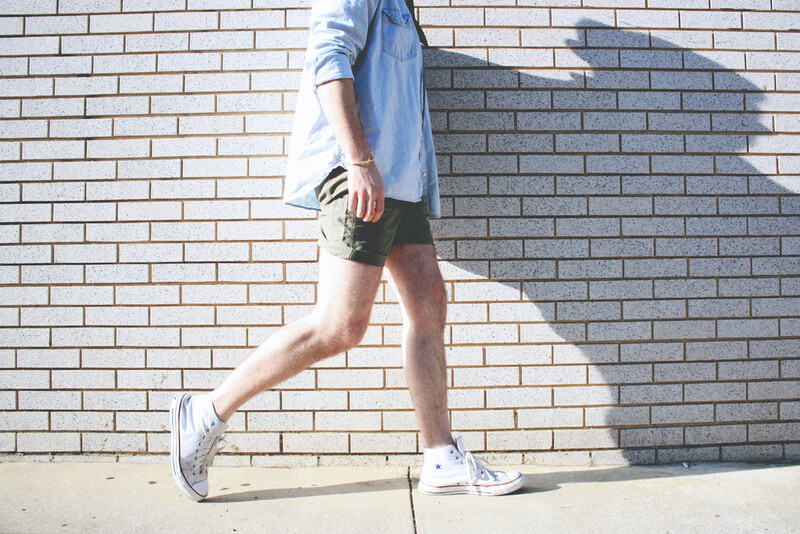 Hence these safari-inspired shorts. I feel very Laura Dern in Jurassic Park in these. Which frankly, is the only vibe I'm ever trying to channel at a Music Festival. If you need me, I'll be over here, dreaming about Palm Springs and looking forward to my upcoming concerts this summer. Beyoncé anyone??? Oh Thirsty Thursday, you beautiful weekday, you. It's no secret that I love a good cocktail, and (when the weather calls for it) enjoying it outdoors. 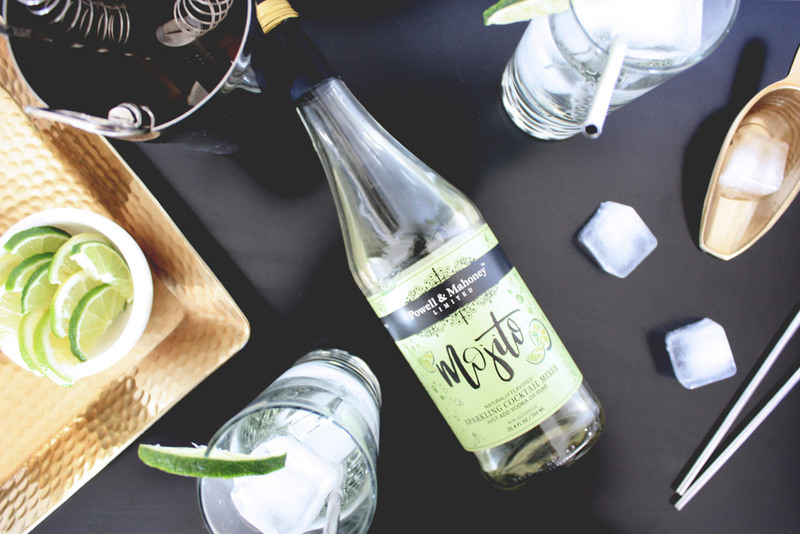 With the recent surge of sunnier weather - knock on wood - I figured it was the perfect time to share a fresh springy libation with you. The Red Pepper Cocktail. 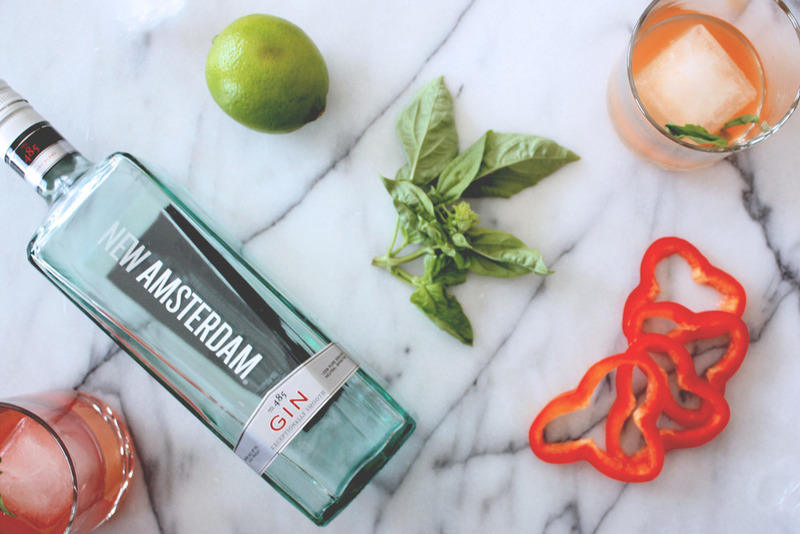 Deceptively simple to make, all you need is a red bell pepper, a handful of basil, a lime, and your poison of choice. Today, I'm using gin. Muddle strips of pepper, basil and the juice of half a lime in a cocktail shaker. Add 1.5 oz of gin and some ice and shake. To serve, just pour over a large ice cube in a rocks glass and garnish with a ring of pepper. I also like to add a little pinch of salt, just because. Are you loving these vegetable-infused cocktails? Then you should definitely give my cucumber basil cocktail a try. 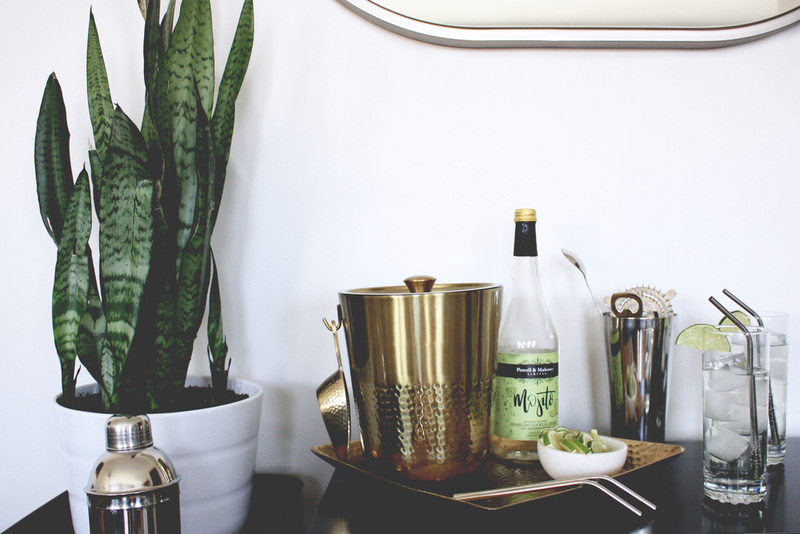 Or, if you're feeling adventurous - make your own cucumber-infused vodka! Myself, I'll be over here enjoying the sun with my red pepper cocktail in hand. Cheers! Happy hump day, all! The sun is shining, the birds are singing and - wait, wasn't it just yesterday that I was trapped indoors watching the rain? That's spring for you. And since I've been having a moment with spring style lately, I wanted to share with you one of the spring trends I'm loving: the Mock Neck Collar. The style I'm wearing here is from H&M (and we all know how I feel about their Modern Essentials) and is similar to a polo shirt in style. With a button placket and piqué textile, it feels classic prep, but with modern details - ie, the mock neck collar. Of course, the mock neck isn't limited to polos alone, they are also all over sweaters at the moment, too. 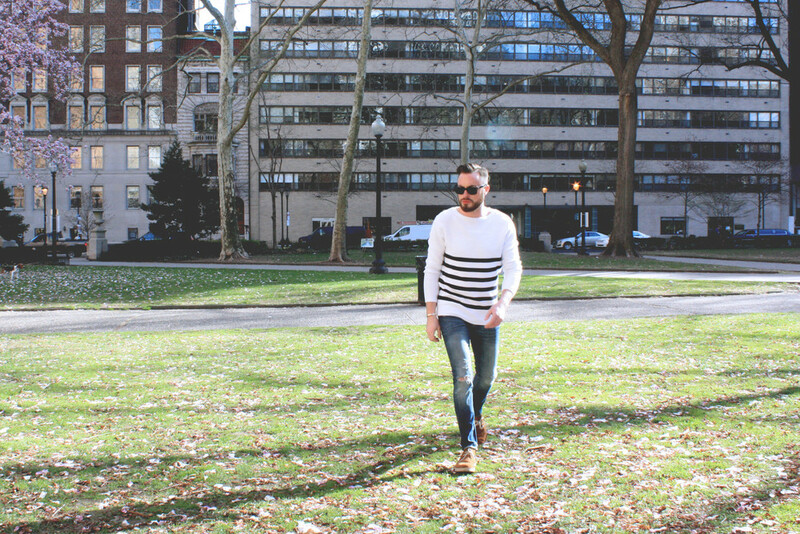 Just picture if you will, a lightweight sweater with little barely-there mock collar. Love. 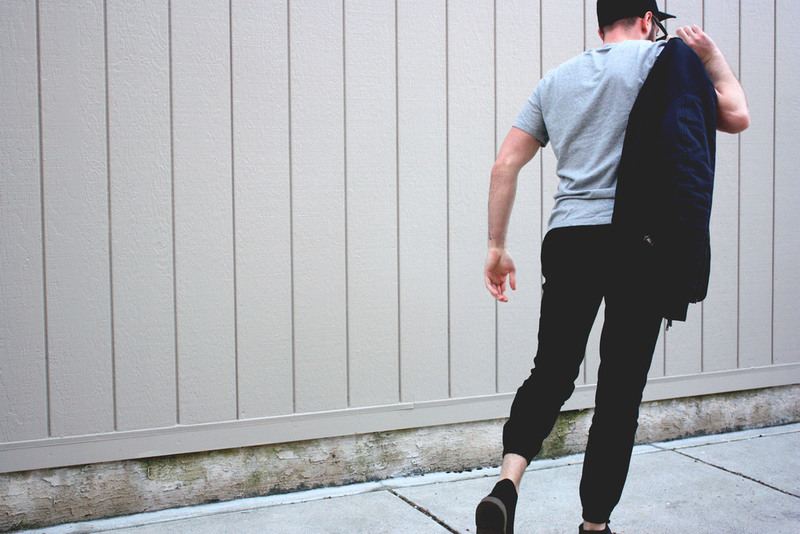 You could even style it the same way I did, with these joggers that I can't seem to get enough of. Love the joggers, but maybe mock necks aren't your thing? Try a more casual spring style instead. To me, its about layering. (Isn't it always? If you take one style tip away from me, let it be known that layers are always your friend. Fact.) Personally, I always embrace the beach vibes and wear swim trunks even if the water is far too cold to consider dipping a toe in. It just feels wrong to me to wear normal pants on the beach. You feel? 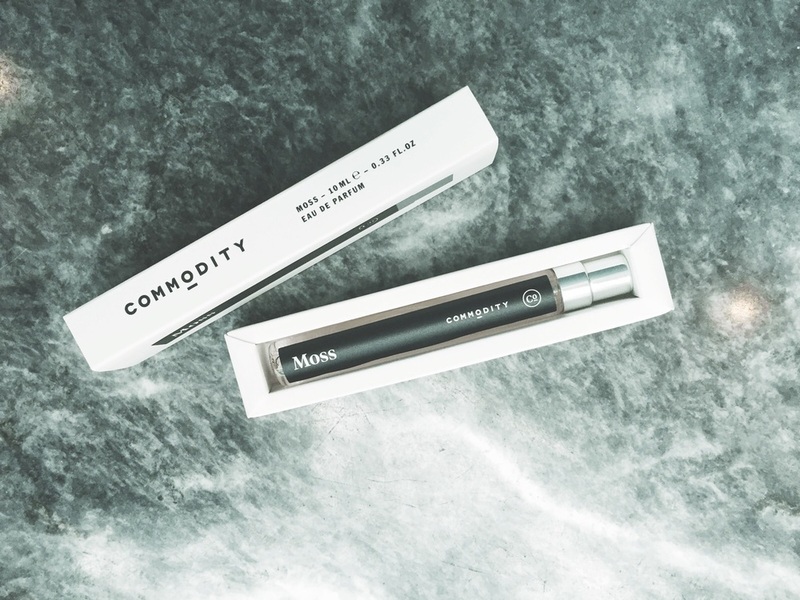 If you're looking for some more tips on what to pack for your Spring Break adventure, check out my Packing Guide chock full of outfit and skincare ideas for any climate. Oh, and as a nod to National Sibling Day yesterday, I'm going to fulfill my duty as an older brother and share this outtake of my gorgeous sister being a siren on the beach. (She's probably going to kill me for this, but it's worth it.) Cheers! TGIF. The weekend is here again. Is it just me or has this week seemed to drag on for ages? Maybe it's all the back and forth weather we've been having. Yeah, let's blame it on that. Since April has been unusually cruel, I'm choosing to look on the bright side, and see it as another opportunity to wear some of my favorite outerwear, the Satin Bomber Jacket. I've written about my love affair with the bomber before and yet, it bears repeating. This satiny finish bomber has become an absolute essential of mine. No surprise of course, seeing as it came from H&M and we all know how I feel about their Modern Essentials. This piece has truly become a go-to in my wardrobe. Easy and effortless, but still clean and sharp. Especially since my default errand-running outfit is usually some kind of jogger and sneakers. It really ties the whole athleisure trend together in a v chic way. 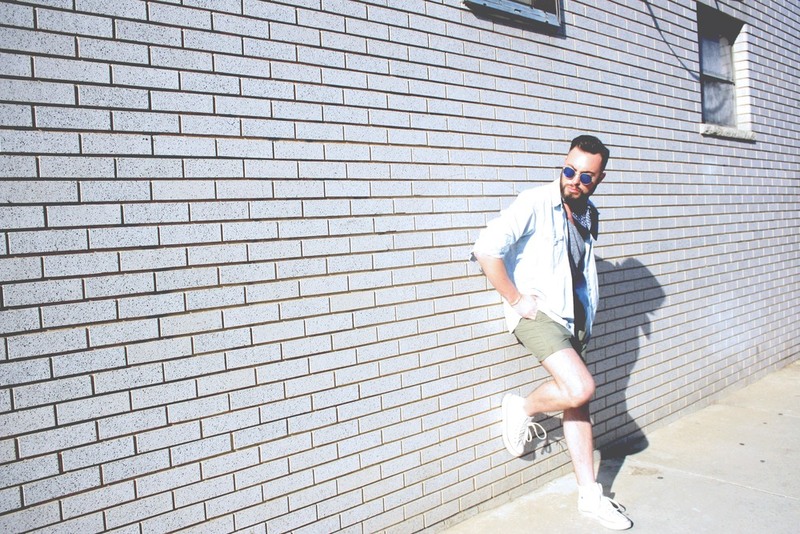 It seems silly to even say I styled this look, since, let's be honest - it couldn't be more of a no-brainer. I'm all about low-effort-high-payoff this week, can't you tell? But the good thing about wearing a great jacket like this is that you can wear it with pretty much anything, say, a tee shirt and joggers, and still look pulled together. Now sometimes, you have the time and energy to commit to a luxurious multi-step recipe, and other times, you want that luxurious complex flavor, but want to spare the energy spent creating it on other things. Like drinking. Today is one of those days. Luckily, my dear friends at Powell & Mahoney have days like today covered. Happy Hump Day, everyone! 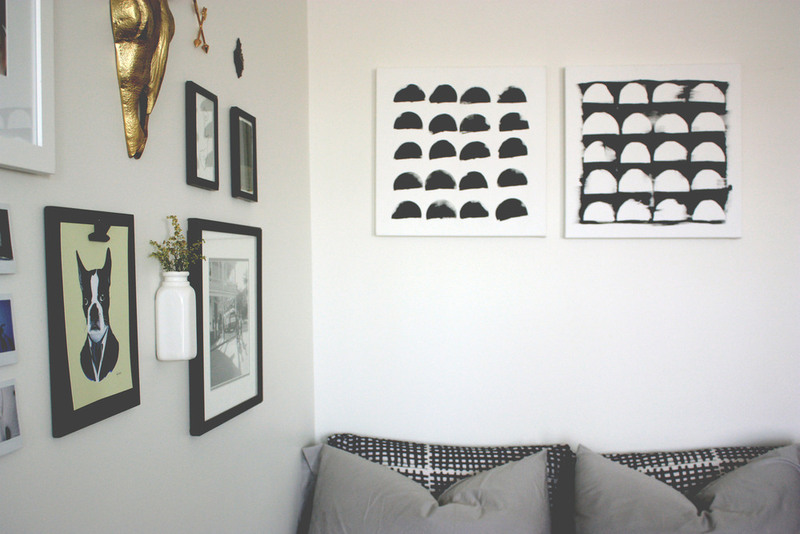 Today, I wanted to provide you all with a little midweek Interior Inspiration, so I'm sharing another one of my favorite topics: The Gallery Wall. You may remember I shared my process for creating the Gallery Wall in my living room previously (which you can check out here) but today I'll be sharing some new tips from the one I recently hung in my bedroom. Check it out. Ain't she a beaut? (No, not the dog, though she took residence while I was shooting this, and who am I to deny a face like that?) I'm even more pleased with this one than I am with the one in my living room (if that's possible!) Like any artistic endeavor, there are no real rules here, I just wanted to share a couple tips to help make your Gallery Wall as good as can be. First, make sure to choose a color palette - it can be as many or as few as you like. I personally always keep mine on the smaller side, but do you, boo. I wanted a bit more color in my bedroom than the living area, so I incorporated a couple bluer tones in addition to the neutrals. Second, remember a variety of textures, shapes and sizes are everything. Think outside the frame! Use small objects, polaroids, postcards - even something unexpected, like my little bottle and flower. And as always, remember to make it personal. You want it to feel like yours, so find or make pieces of your own that feel special to you. Don't have any ideas on where to start? Check out this Easy Printed Canvas DIY I did here - the pair of them ended up on my wall, and I'm so pleased with their look! 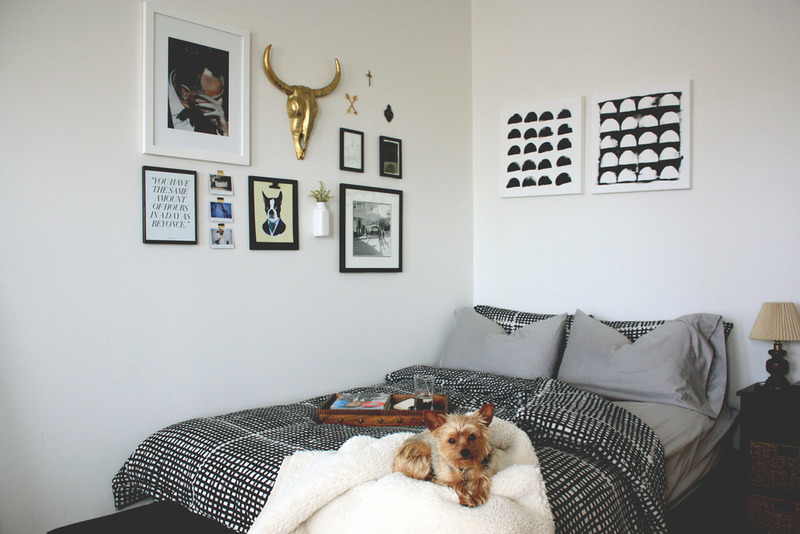 Final note- is having too many Gallery Walls in your home a thing? Is it wrong to love them so? If it is, then I sure don't want to be right. Who's with me? Ah, Mondaze. April is officially here, and as we know, that means we have our fair share of chilly rainy days ahead. 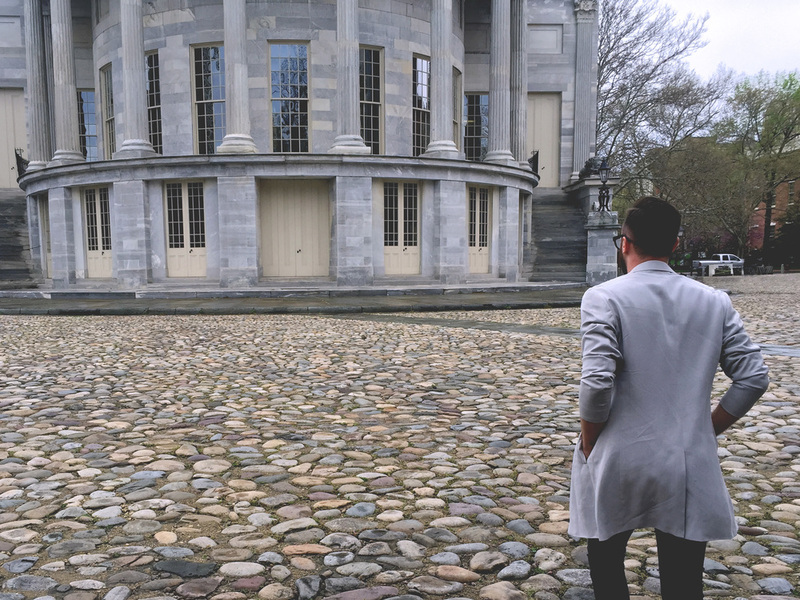 I spent the weekend exploring Old City with some friends, and on the way, wanted to wear a little something that could withstand the elements. This trench from Topman is ideal for this unpredictable spring weather - lightweight, but still protective from the rain and drizzle. I styled it with a black tee and my trusty ripped jeans to keep it casual. The trench has a tendency to feel stuffy and formal when dressed up, so I felt this tee-and-jeans combo was just right for a little weekend stroll around the city. Dig the trench but wanna see it styled a differently? 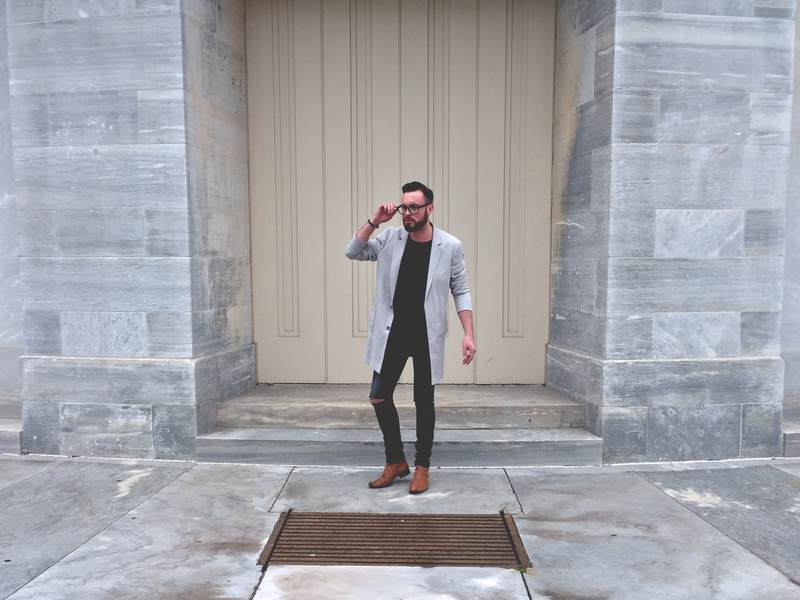 I've got you - check out my athleisure take on the trenchcoat here! Wishing you all a good start to your April as we move ahead into the week. Here's to warmer weather and clearer skies ahead! Cheers! 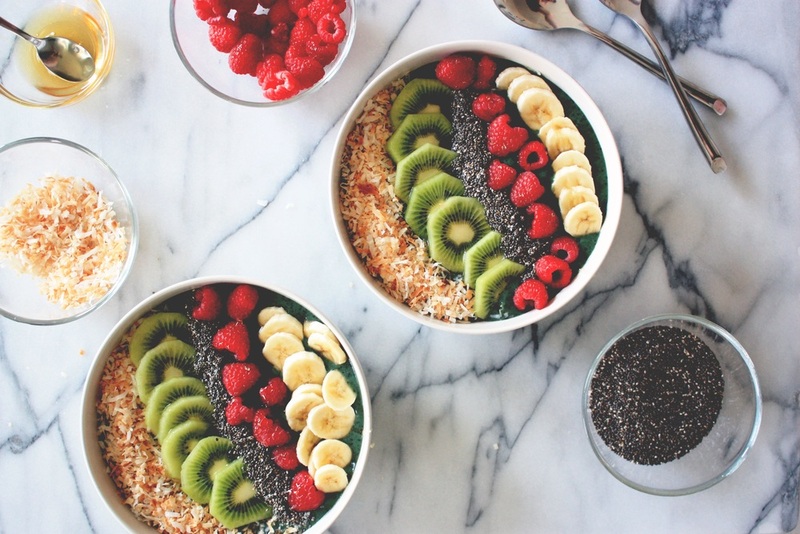 Spoiler: ok, so smoothie bowls really are as simple as the sound. That's right, a smoothie in a bowl. But when topped with all sorts of delicious add-ons, the humble smoothie becomes something delicious, and obviously, very instagrammable. Which of course, is of the highest importance. 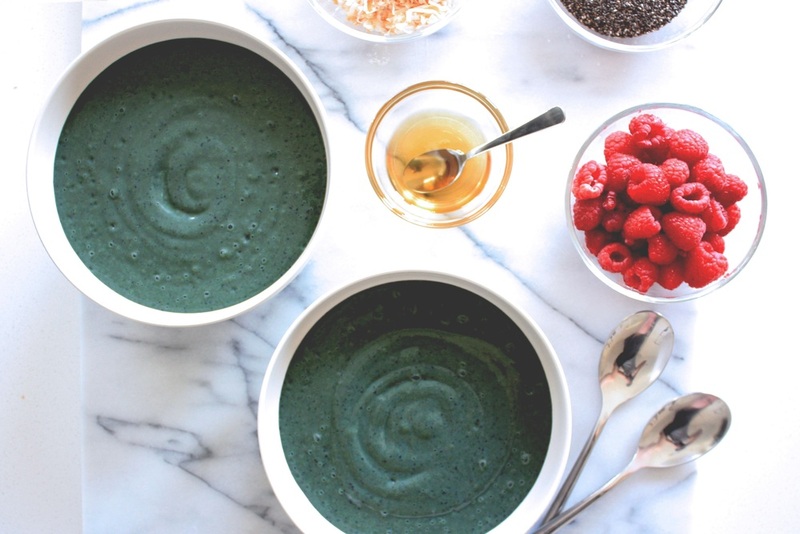 It seems silly to even offer a Smoothie Bowl Recipe, but here it is. The basic formula for a successful Smoothie Bowl contains 1 cup of frozen fruit, 1/2 cup of greens, 1 banana, and 1/2 cup of liquid of your choice. Of course it's the toppings that come afterwards that are the fun part. Today, I made a spinach/avocado/blueberry/banana concotion. Yum. Not a fan of your smoothies in a bowl? Prefer something a little greener instead? Check out my healthy green smoothie recipe here. Maybe green isn't your thing (don't blame you) but you still want an energizing morning smoothie. In that case, let me recommend my Yellow Power Smoothie. However you spin it, smoothies (in a bowl or nah) are here to stay. And with spring break, and summer swimsuit season quickly approaching, I'd say it would behoove me to step up my fruit and veggie intake a bit more. Who's with me? Cheers! TGIF. Amirite? For some reason, March has seemed to drag on for at least 3x longer than it should have. I, for one, am pleased that the weekend brings April along with it. And, what better way to the start off the weekend but with another great piece from the H&M Modern Essentials collection. 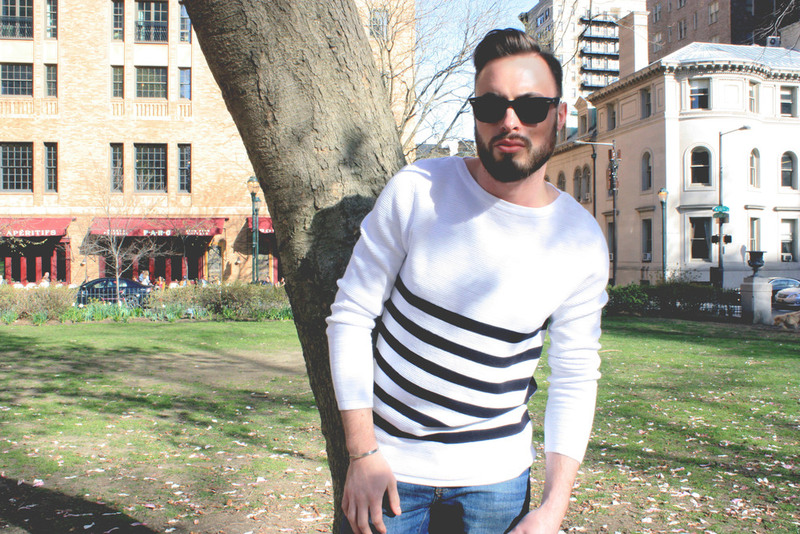 Now, you may recall that I've shared one of my picks from the Modern Essentials collection previously (which you can and should revisit here) but this Nautical Striped Sweater by David Beckham has become a new favorite of mine. While it may officially be April on the calendar, the temperatures haven't quite caught up yet, and this lightweight sweater is just the thing to wear until they get the memo. As is the case with this collection, the beauty in this sweater lies in the details. It features a boat neck collar, and a unique ribbed texture, all the while being lightweight enough to wear on it's own or layer with a light jacket. 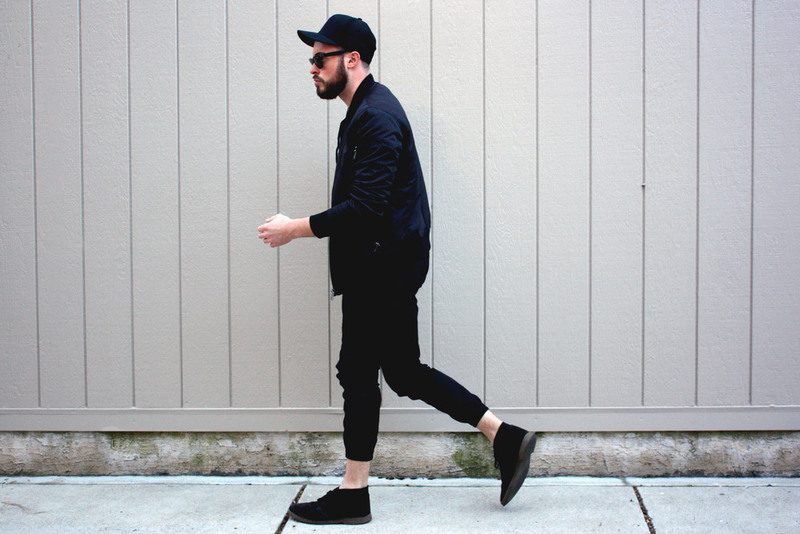 PS, more more tips on layering for spring, be sure to check my previous post here. Like I've said time and time and time again, I'm not sure what it is about the spring that brings out my inner prep-style, but this sweater falls right in line with that vibe. Dig the prep look but still dipping your toe in the water with it? I feel you. Maybe something like this is more your speed. Hey, I'm just trying to help. What's everyone doing this weekend? I want to know! 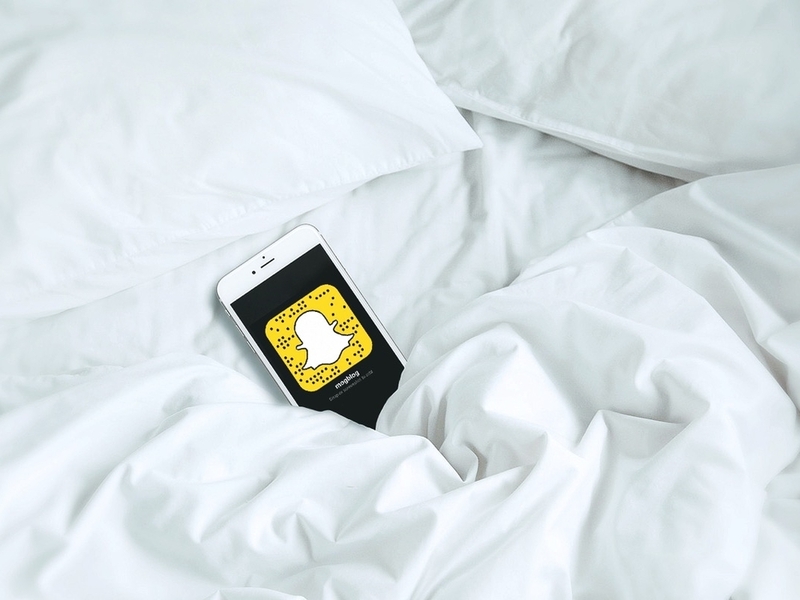 Be sure to follow my nosey self on Snapchat @mogblog so I can follow you back and we can creep on each other all weekend. K? Sounds good. Happy Friday! My favorite day of the week is here again - Thirsty Thursday. And boy have I got the perfect cocktail for your unpredictable early spring weather. The Gin n' (grapefuit) Juice. 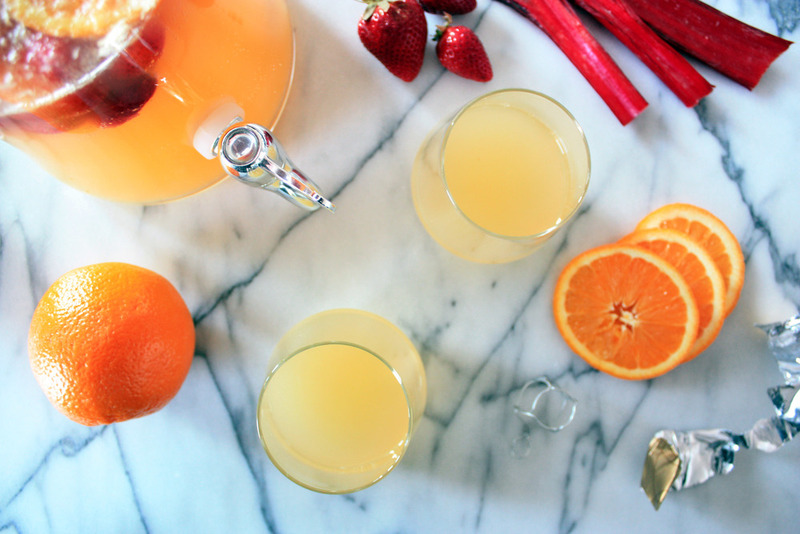 Also known as the Greyhound, it's chock-full of Vitamin C... so it's basically healthy. Right? Can't be getting sick as the temperatures are (slowly) starting to rise. Immensely simple in preparation, but the elegance of this cocktail lies in its simplicity. Of course, I'm going to put a personal twist on it, but you wouldn't expect anything less, would you? To make my version, muddle a couple basil leaves in the bottom of a shaker and combine with 1/2 cup of grapefruit juice and 2 oz of Gin. Top with Ice and shake. But when you're out on the go and chillier weather is in the air, layering is your very best friend. I find myself doing a lot of walking here around the city, and while it may be chilly in the mornings, by midday the sun is a lot stronger than you may think! That's why I turn to classic outfits like this - perfect for travel, and whatever the March weather may throw my way. My base layer is a classic white T (I don't even need to explain this one, do I?) and top it with a grey crew neck sweatshirt. On a more mild day, this is a great look alone. But for an extra brisk morning, I throw my trusty denim jacket on top of it. Easy to pull on or off, this piece is an absolute classic. Seriously. I've had this one since I was in high school a million years ago. In keeping with the athleisure vibe inspired by the crew neck, I finish the look with a pair of joggers (they're here to stay) and my beat up white sneakers. This way, I'm able to be mobile, comfortable, and chic for whatever the day brings. A word about the details: what takes this look from something you'd see on a mannequin to something a little more personal is in the way you accessorize it. For example, I wear this vintage gold bangle that was given to me as a birthday gift years ago. It's something that nobody else has, and gives the look a little special touch. I also like wearing this little bandana around my neck, because it serves dual purposes. Not only is my neck warm, it's a nice subtle nod of pattern in an otherwise solid look. One day it's sunny and 75, the next, it's cloudy with the threat of snow. That's March in the northeast for you. I act like I'm complaining, but to be honest, I'm happy to have another chance to share some of my favorite outerwear with you all. A big trend (for men and women!) this season is the bomber jacket - and I'm totally on board with it. No bulky collar, cute cropped length, and scrunchable sleeves (you know I love an exposed forearm) they're the perfect piece for early spring. 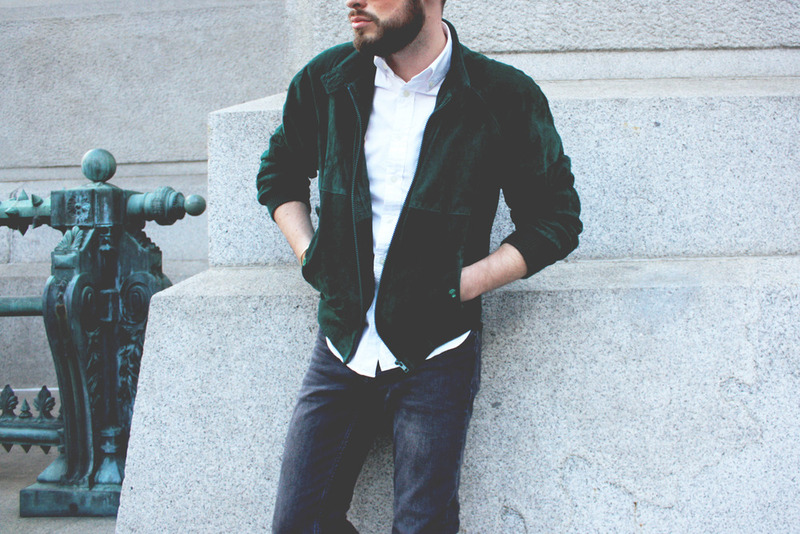 In keeping with the season, I felt this petrol green suede number was a just right for the chilly weather, so I hit up Love park here in Philly to show it off. I especially love this jacket in because it has so many great little details. Plaid lining, a scalloped vent in the back, matching green buttons on the pockets. What's not to love? Did I mention it's vintage? I picked it up for less than 40 bucks at one of my favorite second hand spots in Pittsburgh years ago. Because the color is so bold, I kept the rest of the look simple - white shirt, grey jeans, and these rust-colored suede Clarks. Something about this chilly early spring weather just calls for a suede-on-suede moment, no?